Carter Burwell, best known as the composer of original music for all of the Coen brothers' movies, brings intelligence, restraint, and inventiveness to his varied projects, often revealing new layers of meaning and emotion. His music is melodic without being syrupy, and his instrumentation is fresh and often unpredictable¡ªthe perfect antidote to the heavy-handed and simplistic movie soundtracks that we are all too familiar with. Burwell moves fluidly between independent and Hollywood films, balancing his work on such relatively small-scale movies as the Coens¡¯ recent A Serious Man and the upcoming film Howl, about Allen Ginsberg¡¯s obscenity trial, with bigger-budget Hollywood works such as the megahits Twilight and The Blind Side. His idiosyncratic and affecting music for Spike Jonze's Where the Wild Things Are, complementing songs by Karen O, was crucial to the film, which is essentially an emotional mood piece. Interviewed in his studio space in Lower Manhattan, Burwell gave insight into his creative process by discussing specific scenes from his work, and talking about some films that inspired him, including Psycho, with its all-string score by Bernard Herrmann, and Forbidden Planet, with its avant-garde theremin score by the Greenwich Village couple Louis and Bebe Barron. Before focusing on film scoring, Burwell was an animator, computer scientist, and musician. The wide-ranging curiosity and passion for originality that characterize his music are also on display in this thoughtful discussion. How did you start imagining the music for A Serious Man? Like many of the Coen brothers' films, the film takes place in a very specific milieu. In this case, it's a Jewish suburb of Minneapolis in 1967. It's pre-psychedelia, and you're not quite into the sexual and drug cultural revolution of the late 1960s yet, so this particular neighborhood is balanced between a culture that's thousands of years old and the oncoming one that's just being born in this country. The script had specific musical references: Jefferson Airplane, F Troop, Sidor Belarsky. Belarsky was a Jewish opera singer who also made some Yiddish records, and there's one Yiddish song that [the Coens] just loved. These songs were in the script, and that was basically what I had to go on at first. Joel and Ethan had no suggestion about what the score should be. They just said, "Well, this is what you've got. You've got Jefferson Airplane and F Troop and Sidor Belarsky." Was there a specific Jefferson Airplane song in the film? Before the Coens had even cut more than a reel, they called me to say that they'd like me to start working on a piece of music that comes out of a story told entirely in Yiddish in some unspecified old world and leads right up to the opening bar of Jefferson Airplane's "Somebody to Love." The idea was that during this transition from the shtetl to the Jefferson Airplane, you're traveling through the ear canal of this boy in Hebrew school. It's a dark and mysterious tunnel, and when you finally get to the end it turns out that it's the earpiece of his portable radio through which he's listening to Jefferson Airplane. That was the first piece of music I wrote for the film. But for me, the film is really about a person who is balanced somewhere between life and death. Throughout the whole movie, death is hovering on the periphery. The metaphor of the movie is the first lecture that the university professor, Larry Gopnik, who is our main character, gives about Schr?dinger's cat, which is a thought experiment in which a cat is simultaneously dead and alive. It maintains that situation until you observe it to determine which it is. I see Larry as being in that situation himself, so the question for me as the composer is what can I do musically to suggest that. I found it was useful to have a motif that would repeat endlessly, to suggest that no matter what goes on in the film, he's not really getting anywhere. He's blocked at every point in his personal, professional, and spiritual life. And there's something about the delicacy of the harp that I think on the one hand seems sympathetic to this character's travails, but on the other hand is a little bit funny, because in fact none of these characters reveals any delicacy whatsoever. In every way, they're indelicate. One thing I enjoy about this harp motif is that it's polyrhythmic: you can count it in three or you can count it in four. I personally enjoy that ambiguity. The piece is so repetitious, and yet you're not sure where the bar lines are, so it's kind of interesting. And it has a thematic connection to what the film is saying about that kind of uncertainty. Right. I tried to put other things against that motif that didn't quite fit with it. So there's a piano melody that's in a different meter than the harp piece. There's also this very slowly moving chordal stuff underneath which is more dark. None of what I've said explains why this would be the right music for the movie. I tried other instrumentation that sounded like it bore some relationship to Jewish music, but anything like traditional Jewish music, like violin or clarinet, seemed to immediately tell you, "Oh, the surface is what we're looking at. It's a Jewish community and a guy who is having issues within that community." That didn't seem right to me, but I developed some of those themes anyway, just to show to Joel and Ethan. But I played them the harp-piano piece first, and happily they immediately got it, even though I didn't have any good verbal explanation for why it was right. Sometimes I have elaborate arguments set aside to convince directors I've made the right choice. You've had 25 years with the Coen brothers. Yes, so there's trust there. Still, if they don't actually buy it in their hearts, it's not going to work. I'm happy to say in this case, they got it right away. Does a particular scene come to mind where the use of harp is particularly strong? 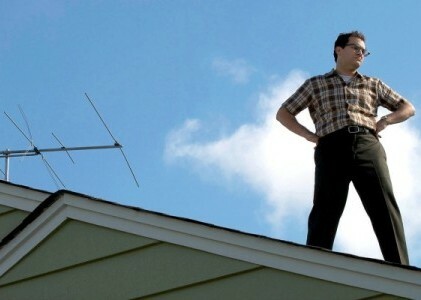 There's a scene in which Larry Gopnik goes up on the roof of his house and adjusts his TV antenna. It's a longish scene, about three minutes, and without dialogue, so everything is focused on the sound. It's hypersubjective. It's just this one man on his roof looking around the neighborhood. As he adjusts the antenna, we assume there would be sounds coming through the ether into the antenna, but I wasn't sure what those would be. Skip Lievsay, who was the sound designer and mixer for the Coens, was coming up with that stuff on his own. But that was the scene that I worked on and that I showed the Coens when I first had this theme together. Where the Wild Things Are is about letting us experience Max's emotional life. The film is carried by emotion, and the music is an important part of that. The film is nothing if not about emotions, and so the music was extremely touchy. It was very, very difficult because, for one thing, at the point at which I was working on it, the Wild Things' faces didn't move. Their faces were inanimate when they were shot, and then computer animation was added to them later. And I ended up writing my music before the faces were animated. So I had a general sense of what sort of emotion was in the air, because the actors are great and their voices convey a lot, but honestly, I couldn't always tell. For example, is Carol upset because he's feeling remorse, self-reproach, frustration, or anger? These differences are important if you're trying to write music. In the end, I had Spike [Jonze] come in and sit next to me, and basically do the faces of the Wild Things. We spent a lot of time stopping the film, and Spike would say, "OK, think about when you were in high school and you saw your best friend walking with someone else and you weren't sure if ..." Even in the recording session, we'd stop and Spike would say, "OK, you just got out of a club at night, and you're with these cool people you've just met and you're walking down the street and you're thinking, Wow, this is so great." Basically, Spike conveyed the emotions, which were sometimes hard to get off the screen because of the absence of these faces. What made the music challenging was that there are certain scenes where the emotional tenor changes 20 times within the scene. The ultimate example is on the beach where Max is leaving the island. It's a five-minute scene, and the emotional meaning of what's going on is changing many times a minute. The challenge is to write a piece of music that's cohesive as a piece of music, yet that can make all those twists and turns. When I saw the film finally finished, I thought that maybe it was all too much, that the very emotionally representative music that I wrote combined with these very emotional yet computer-generated faces was overstating the emotional facts of the case. But, I have to say, I'm usually overly sensitive in that way. I prefer to underscore the movies that I work on, and this was a case where Spike would not accept that. Most of the time, he really wanted to state clearly the emotional import of everything that was going on. It feels like music that Max could have written. A lot of people have talked about how it's not really a kids' movie. The music is in the same subjective spirit: it's what Max is feeling, so it has that childlike quality to it, but it also has a different perspective, which you would usually call the director's perspective. It's certainly important that it all feel like it all comes from Max's head. There's no other way to look at it. I think that more so than most films, it's hard to ignore the influence of the director while you're watching this movie. It's just such an unusual film. It would be hard for someone familiar with filmmaking to watch the movie and not be thinking, "How in the world did he get anyone to let him do this?" With regard to the beach scene, honestly I think that scene was the reason I was hired. Spike originally wanted the movie to be done entirely with Karen O's songs, but there were certain parts, like the beach scene, that just couldn't be done with a song because there were so many emotional twists and turns. It would have been very hard to write a song that could do all of it. Also I think Warner Bros. was very uncomfortable with not knowing what the hell kind of movie it was that Spike had made. Not necessarily that they didn't like the movie he had made¡ªthey just couldn't tell what kind of movie it was. They have to market it. Exactly. I think I was also brought in as a way to sell that scene, and thus the movie, to Warner Bros. I think they felt, "OK, if you've got a composer whom we are familiar with and you've worked with Carter before, that'd be fine." I don't think they cared who it was, as long as it wasn't Karen. One of the wonderful things about her songs is that they're ambiguous¡ªyou know little about what's going on. They've got this beautiful poignancy about them, but they're not happy, and they're not sad. It was just a comfort thing for Warner Bros. to know that there was going to be some composer who would handle that job on that scene. I'm not comfortable with everything I just said to you, because I don't like to be the dependable traditional composer. That's not the way I like to think of myself. Some of the other stuff I did in the film is, to me, more interesting musically, with more interesting instrumentation. But for that scene, it just seemed that we needed to fall back on all of the traditional Hollywood scoring¡ªwhat you might call its armamentarium¡ªso that we were absolutely certain we would tug feelings out of people at that point and not distance anyone from what was happening in that scene. So it's strings and the harp and piano and woodwinds and horns. It's very traditional film scoring. No Country for Old Men is a good example of a film where there's an intuition from you, the Coen brothers, and the sound team about the sound design. The sound effects become the music in a way, and the film needs a kind of silence to work. We didn't know at first that it was going to be as free of music as it ended up. Usually, when you score a film, you use music to do things like soften up the listener: they hear music and relax and open their emotional side. But, at the same time, the moment you hear music, it reminds you that you are watching a film. And with No Country, it weakened it to hear anything that was recognizably an instrument, that reminded you of the traditional Hollywood approach to scoring a thriller. Whenever an instrument came on, it just wasn't right. And then I tried all these sounds that weren't instruments. I tried just percussion, or just harmonics on a violin. But, even those sounds didn't work; the moment you perceived their entrance, it changed the nature of the film. In the end, all the music that's there¡ªand it's only about 13 minutes' worth¡ªwas snuck in under sound effects. You hear the sound of car tires on gravel and that brings in a piece of music. And then when the car sound goes away, the musical tones are there, but they don't register as music. In the scene where Javier Bardem is in the gas station, taunting the owner, we used wind sounds to get the sustaining tone. It's actually a suspense tone, and it's supposed to raise the tension in the scene, which is already extremely tense. I pitched the tone at the same pitch as 60-cycle alternating current, so that it would blend with the refrigerator and air conditioner in the space. Again, you don't perceive its entrance, but there's a certain point at which you are aware that there's something else in the sound other than just wind. But you don't know when it came in, and it stops immediately at the point when he reveals that the coin toss landed heads. That whole film score was an exercise in finding ways to hide the music. And it wasn't that we thought it would be that way in the beginning. It was an ad hoc discovery. It was totally empirical. The first thing I remember about that scene is the crinkling of the plastic. That sound will stand out more if there's no music. That's right. It has to be said that Skip is an amazing sound designer. We've done close collaborations before. Here, definitely, he gets the front seat. On Barton Fink we very much worked side by side. The sound effects in that film are very musical and the music sometimes very sound effecty. I love those kinds of collaborations. Twilight was obviously a big studio film. and it seems that it was a film for which you really had to think about the politics of dealing with a potentially huge teen audience, as well as what the studio wanted out of it. That was unique in that I'd never worked before on something that was so much of a pop-cultural phenomenon. I was unaware of how big it was when I started working on it, and I think the studio was largely unaware too when they started the film. When I came on, I went out to Portland to meet Catherine Hardwicke to talk about it. She was going to show me some of the footage. I was kind of dubious, and I wasn't sure if it was the right thing for me, honestly. She had just gotten a memo from the company making the film, Summit, that due to an outcry from the fans, they were going to add a scene in which Edward is going to play piano for Bella. This scene was in the book, but it had not been in the script, I guess because it does not advance the plot. But the studio had been reading blogs and had realized that there were so many people who wanted to know what Bella's lullaby would be that Edward writes for her in the book. The book references this piece of music, but of course in the book you don't hear it. So now the movie is going to come out and they're going to get a chance to hear it. The studio had just sent Catherine a memo saying, "You're going to have to shoot this scene with Edward playing piano for Bella." It goes without saying that no music had been written at that point, and that they hadn't hired a composer. When they shot the scene, Robert Pattinson had just improvised something on the piano. I think in the back of his head he was hoping that, because he's a musician, what he did would be Bella's lullaby. And Matthew Bellamy, who is in a band called Muse¡ªthe author of the books actually dedicated some of her books to the band, because they mean that much to her¡ªhad also written something of his own that he had submitted as Bella's lullaby. Then, of course, there were the ideas of all these fans about what Bella's lullaby would be. When I was finally hired and given the task of writing Bella's lullaby, frankly the fact that it had all that attention didn't make it any easier. When I was starting, there were already hundreds of Bella's lullabies out there which I have to say is not a problem I face in Coen brothers films. I ended up using for Bella's lullaby a piece I had actually written years before for my wife, Christine. I wrote it before we were married, during a difficult part of our relationship, and it just captured the difficult relationship between the two characters in the film very well. It was so perfect that I wasn't going to play it for anybody until I asked my wife, because it was for her. And Christine said, "Sure, use it. I think it will be great." So that's the seed of the piece that I used in the film. But when the soundtrack album came out people online were livid: "This isn't what I thought Bella's lullaby was going to sound like." On the other hand, some people said they loved it. In the end, the album went double platinum with this piece of mine on it. It's been interesting, that's all I can say. You actually had studio executives saying they didn't like specific notes. This was a case where the studio wanted to sign off on everything. It's not actually typical that studios will hear all of the composer's sketches before we record, but I notice that more and more, the smaller studios feel they have a fiduciary responsibility to have heard everything before it's recorded. Catherine arranged to play the stuff for the executives. This was after we had been living with the music for a month, and had used it to score the whole film, really. We played it for them, and in the end, one executive said, "What's that first note?" "B flat." "It sounds off." "Yes, it's a dissonance. It's a B flat over an A minor chord." "Well, can we fix that?" It's the first note of a melody, and it immediately resolves to a consonance, but that's the tension that starts the melody and gets it going. No amount of musicological stuff I could say would change the fact that it was annoying him. And it continued to. I thought, "Well, that's fine, he's annoyed." Never for a moment did I dream I would have to pay attention to what he was saying, because I've never had to before. But he would call me and then other people would call me. Finally, he called at one point and said, "You know I'm not going to sign off on that." Which meant: we're not going to record it. At this point they'd had the music for five or six weeks, and I felt it was too late; I was going to spend a couple weeks with my family because I'd been working on the movie nonstop for six weeks. I actually got on a plane that day. Before I did, I said, "I completely understand if you want to hire someone else." The whole time flying across the country, I was thinking, "Was it worth trying to somehow get on the good side of these people?" By the time I landed on the East Coast, I thought, "It would be a shame if all this good work I'd done was thrown out, and maybe there's some way, as they say, to throw them a bone." I spent a day trying to come up with some variations that person would like. There would still be the B flat, but there would be some variations that would temper that feeling. In the end I heard from Catherine that this executive bought one of the variations. I just put that in different places in the film and kept the B flat in different places too. It's a classic Hollywood story: the executive doesn't like this dissonance and you have to remove it. Andr¨¦ Previn wrote a whole book on it called No Minor Chords based on a joke from one of the old moguls who didn't want any minor chords in their scores. You've said that some of your favorite music from older Hollywood movies is from science fiction or horror movies rather than big prestige films. The score for Forbidden Planet was basically composed by a bohemian Greenwich Village couple. It's probably one of the more avant-garde scores you'll find in a Hollywood film from the '50s. Sonically, it's quite striking. But, the amazing thing is that here is a movie with Leslie Nielsen in the lead, and you're listening to this raw electronic music. I think Bebe and Louis Barron built their own circuitry. This was before you could buy a Moog synthesizer and cables together. They didn't know what the circuitry would do, and a lot of times it would just self-destruct. But they did the smart thing of always having a tape recording when they turned it on, so if it self-destructed and only lasted for two seconds they would at least have a recording of the two seconds. They would collect these odd sounds from the circuits they would make and then they would decide what sort of emotions and drama the sounds suggested, and then find the right scenes to fit them in. It's almost kind of backwards, but ultimately what I think is amazing about it and what I don't understand is how the studio got on board with this. Some crazy person must have thought, "Yes, this is a great promotional PR gimmick: the first Hollywood movie with an electronic score." Bless that person, because it's so unusual. I remember seeing it my twenties. The story is sort of a version of The Tempest on another planet. I love the colors, The music is endlessly fascinating, because the composers do the sound effects as well. They create a synthetic soundscape that's unified and has its own integrity and is completely different from anything that's in any other film at that time. That's fascinating, and it was done at MGM, a major studio. This wasn't low budget, where you can sometimes do what you want without drawing the attention of the studio executives. You were very involved in early computer programming. In college, I was getting into electronic music just as I was graduating. I stayed behind, after I had graduated, to help teach an electronic-music class with Professor Ivon Tcherepnin. Ivon was an amazing composer and teacher. He helped open my eyes to what constitutes a piece of music. But I also love gadgets, especially the analog ones that we were using in those days. You get a sense of the tactile feedback from something that has electrons running through the circuits, and it results in something as ethereal and emotional as sound. The score for Psycho is all strings. It was a conceptual exercise for Bernard Herrmann. The idea was to use strings, which at that time were the ensemble for romantic scenes, to score this horror film. It seems like an academic exercise, but look at the visuals in the film and imagine it without music. There's a cold, silky quality to that black-and-white and the use of light and shadow that strings seem just perfect for. And at some Freudian subliminal level, strings might suggest the love of this boy for his mom, which is very much the driving factor behind this film. Or maybe the idea of scoring this film in that way ties into the red herring in the opening, where you think you're watching a melodrama about Janet Leigh absconding with some money. An aspect of the score that I find relevant for myself as a composer is Herrmann's use of repetition. He was not a big user of melody, but he was wonderful at structuring these patterns that you could listen to endlessly, like North by Northwest or Psycho. In Psycho, these repeating patterns suggest to me the fact that the characters' situation cannot be escaped: Leigh's situation in the beginning or Tony Perkins' later on. This type of repeating module that Herrmann uses does end up arising in my own music, through lack of imagination or just because I think it works so well. Is he your favorite Hollywood composer? I don't have a list. I love Morricone. I never cease to be fascinated by spaghetti western scores. But I admire Herrmann for his contentiousness. I wish I were more contentious. He would storm off quite a lot after cussing at everyone. I'm not so good at that. In the end, I try to make everyone really happy.